Facebook removed a page Tuesday that posted incitements to violence and implied death threats after a Republican lawmaker called the company out. 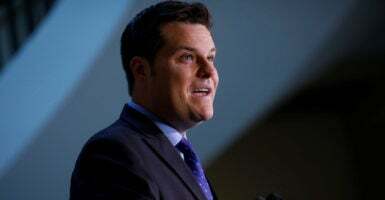 During a hearing Tuesday with representatives from Facebook, Twitter, and Google, Republican Rep. Matt Gaetz of Florida asked Facebook’s head of global policy management, Monika Bickert, why the social media giant hasn’t removed the page, “Milkshakes against the Republican Party,” for its calls to violence against Republicans. “Do you remember the shooting at the Republican baseball game? One of those should happen every week,” one post read, referring to the attempted assassination of GOP members, which almost killed House Majority Whip Steve Scalise, R-La. Bickert read the post back to Gaetz at the hearing. “Any call to violence violates our terms of service,” Bickert clarified. However, Gaetz claimed Facebook responded to his staff after reporting the page earlier that “it doesn’t go against one of our specific community standards.” Later that day, Facebook removed the page. “This distinction is not merely academic, as they are governed by different laws and different rules. If Facebook claims to be a neutral forum, it cannot continue to limit conservative content; if Facebook claims to be a publisher, it will lose its legal ‘immunity’ under Section 230 of the Communications Decency Act,” he continued.